“Today, we’re going to be pizza purists.” Fine by me. If Marc from A Slice of Brooklyn Pizza Tours wanted us to eat cheese, tomato and bread ‘til our stomachs burst, then so be it. I love pizza. I wouldn’t call myself a connoisseur per se, but I can definitely appreciate the difference between a fresh Italian-baked slice to one that’s been mass-produced by a fast-food chain. So, understandably, I was excited to be chowing down on what was supposedly some of the best pizza in New York. The state that is, not the city. We’re talking mega pizza. Marc was about to show us why Brooklyn pizza is the best pizza and, SPOILER ALERT, for those of you who like to read the last page of the book first: he was right. If you haven’t had your lunch yet, look away now. We departed from just outside the Slice of Brooklyn Bus Tours HQ in Union Square at 11am. I resisted the urge to grab a drink from Liquiteria Juice Bar before boarding – after all, today was not about getting my five a day, but eating an abundance of carbs. Marc introduced himself, gave us his ‘pizza purists’ spiel and soon we were on our way, motoring across the Williamsburg Bridge. Marc explained we weren’t to take the Brooklyn Bridge because commercial vehicles aren’t allowed. No matter though; using its neighbour meant we got great views of the suspension cables and moody brickwork that make it so famous. Completed in 1883, the historic overpass - one of the oldest of its kind in the USA - was once the world’s longest suspension bridge and is now a designated National Historic Landmark. Most importantly, as soon as you clap eyes on its unique stone and steel design, it’s easy to fall head over heels for one of New York’s most beloved attractions. From our stop-off point beneath the Bridge, you could see its vast anchorages, granite towers and the steel latticework of its underbelly. We could also see Grimaldi’s – one of the most beloved pizzerias in New York; a real institution. The queues here have been known to go around the corner and then some, with locals regularly clamouring for a coal-infused slice or three. But, with Marc as our leader, we were skipping the lines today. 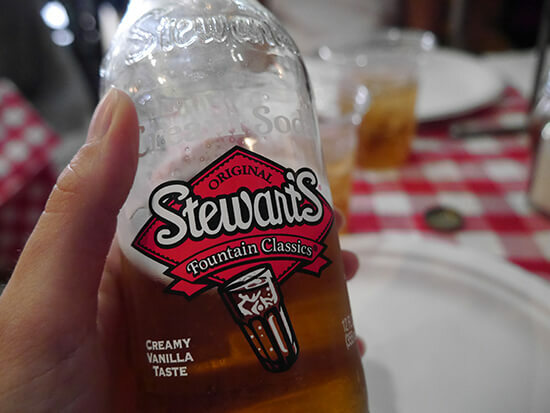 Under Marc’s recommendation, I ordered a Stewart’s cream soda. I’ve had cream soda at home (who remembers the cream soda floats of the 90s? ), but this was something else entirely. Butterscotchy, frothy and packed with sugar, it was what I imagine liquefied candyfloss might taste like. The best was yet to come though. As I guzzled the sweet, fizzy nectar, out came a mammoth circular platter of cheesy greatness. 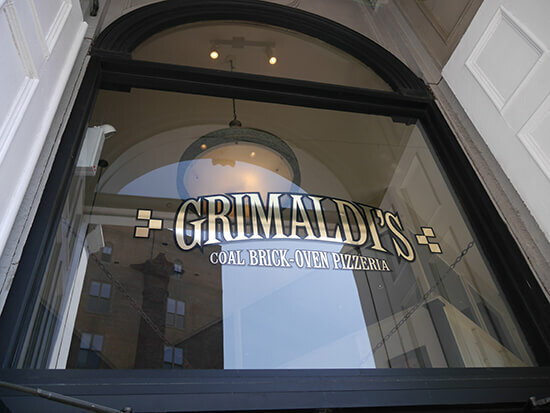 So here’s the deal with Neapolitan pizza at Grimaldi’s: the base is crispy, fluffy and fragrant, lightly dusted in charcoal from the 1,000-degree coal brick-oven. Then there’s the tomato puree. This isn’t your typical passata: it is made with San Marzano tomatoes, which can only be found growing in the volcanic plains around Mount Vesuvius. Yup, you read that right – this juicy, slightly sweet sauce comes all the way from the pizza motherland: Italy. Top that with freshly sliced mozzarella, a splash of extra virgin olive oil, some basil and a sprinkle of parmesan if you fancy, and you’ve got a slice that melts in your mouth. I’d had two slices of the Neapolitan at Grimaldi’s, but it wasn’t enough; my stomach was growling for more. Thankfully, Marc had the perfect distraction. 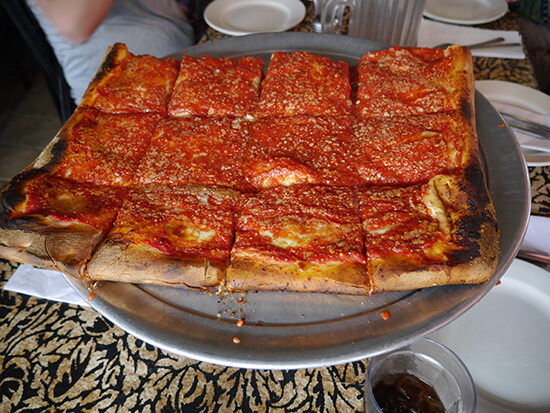 Our next stop – L&B Spumoni Gardens – was a 23-minute drive across the borough, giving our pizza-loving tour guide nearly half an hour to tell us all there is to know about Brooklyn. 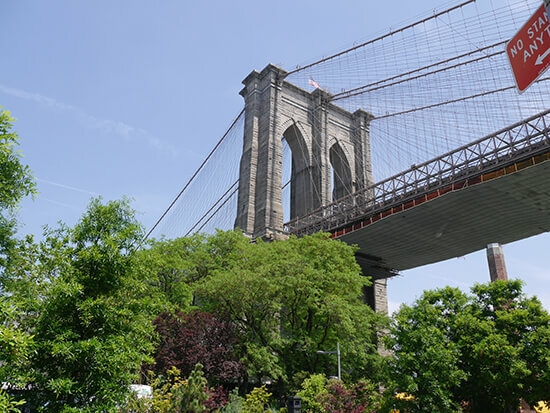 The most populous of New York’s five boroughs (that’s Manhattan, Queens, the Bronx, Staten Island and Brooklyn, in case you were wondering), it turns out Brooklyn’s popularity is on the up these days. Dozens of classic films have been shot here – from Saturday Night Fever to Goodfellas to The French Connection – just one of its many attractions. Indeed, some real estate here can go for more than a place in Manhattan! I wasn’t surprised though – it may not be in the heart of the city, but it looks right at it from across the East River. What a view. 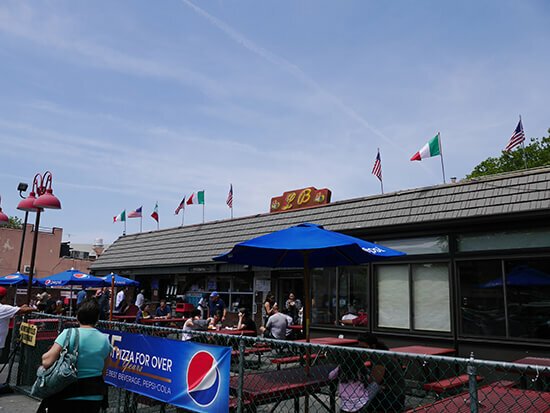 …I did, however, have enough change for an ice-cream, which brings us to L&B Spumoni Gardens in Bensonhurst. Family-run and standing since the 50s, this pizzeria serves a very different pie to Grimaldi’s – ‘pie’ being the operative word. Of the Sicilian variety, these slices have a thick, focaccia-style base. Don’t be fooled into thinking the dough is soggy though. The composition is such that it stays light and crispy. What’s the secret, you ask? Well in order to maintain the base’s structure, the melted cheese goes on first and the tomato sauce second. The cheese creates a barrier between the bread and the sauce, stopping it from going too soft. Top it with as much parmesan as you like and voila: a rectangle slab of deliciousness. Again I had two slices, but this time I was full. All I had space for now was some ice cream. Spumoni’s may be known for its pizza, but the real treat is its sugary namesake dessert. I opted for a combo of its three flavours – chocolate, pistachio and vanilla – and you should too. Just make sure you say ‘Spumoni’ with an Italian accent, and wave your hand in front of your face when you ask for it. Time to walk off all that pizza. We’d eaten so much that Marc practically had to roll us back onto the bus. It was time for one last treat – much to our delight this one didn’t involve food, but a little strolling tour around Coney Island. You’ve all heard of the famous Drifters track ‘Under the Boardwalk’, right? 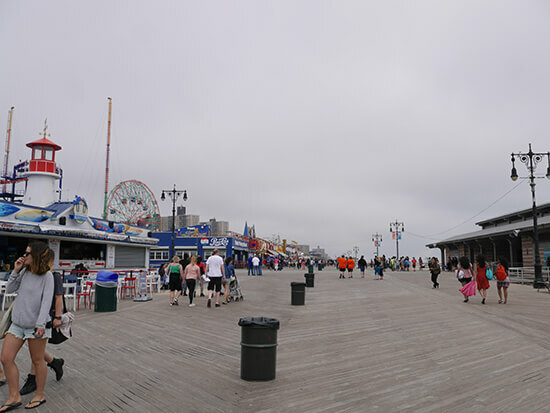 Well this is the boardwalk they were talking about. Marc told us all about this iconic pathway as we shuffled along it, full of pizza and grateful for the fresh sea air. Completed in 1923, it’s a historic link between Coney Island’s three miles of silica and the wonderfully tacky amusement rides of the park. We didn’t ride the iconic Cyclone – or any of the Luna Park attractions for that matter – for fear of forcing some pizza to resurface. But hearing about Coney Island’s history and how the neighbourhood has cleared up its act to return to a place of fun and seaside enjoyment was pretty special. As the pizza fatigue began to wear off, I felt tempted to give the Cyclone a whirl after all… until Marc told us how often people get stuck up the top, that is. Maybe next time. The verdict? Pizza in Brooklyn really is the best pizza, especially when combined with the cosmopolitan culture, history and beauty of this underrated borough. 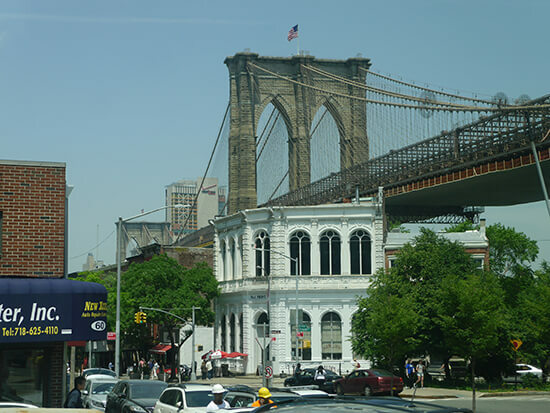 Alex visited New York City on our East Meets West Journey, one of our tailor-made USA holidays. To organise your trip to the USA – and your Brooklyn pizza tour – speak to one of our Travel Experts in-store or over the phone.